Momma Told Me: The phone may be free, but the service isn't. When I got my first mobile phone there were no choices. Nationwide mobile networks were at a minimum, unlimited was a mythical term of hopes and dreams, and the best shopping one could do was hope for an advanced handset with extra Night and Weekend minutes in exchange for a 2 year contract agreement. Boy have we come far in the past 10 years! But I am still amazed at the number of people who don't fully understand the choices available with pre-paid. 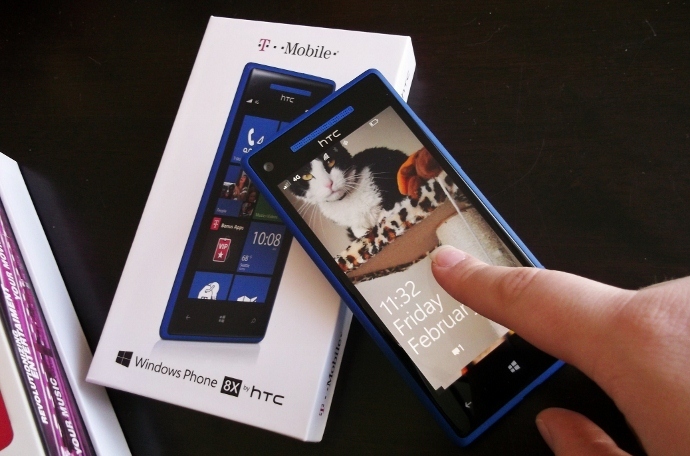 When I received my new #HTC8 Windows phone it came ready for 4G service, and primed to connect to the T-Mobile network. While T-Mobile offers an extensive collection of month-to-month plans, the #HTC8 is so new and hot it is not formatted for the prepaid networks out of the box. Don't fret, however, I assure you this phone can be activated on a no annual contract plan, and is compatible with any of the mobile carrier's options. Of course, buying outside of a contract will mean paying retail value for your handset, but the HTC 8x is well worth it in my opinion, and you can still add on handset protection insurance each month. How is it that a phone as cutting edge and awesome as the HTC 8x works with affordable, commitment free, pre-paid plans? It's as simple as ordering a pre-paid (micro) SIM activation kit from the T-Mobile website. There are many recent promotions where you can score this kit for free, and the traditional pre-paid SIM kit will work just as well, since the HTC 8x includes a SIM card of it's own. It may be a little confusing, but you are actually ordering the pre-paid activation code, more than the SIM, though they come together in the same kit. Once you have your Activation Kit you can install the original SIM card and provide the device Serial, as well as Kit Activation Code, and proceed to choose your plan. While most people will want unlimited 4G coverage to take advantage of the beautiful 4.3" widescreen Gorilla Glass 2 display, and superior speed processor, the phone functions quite will with capped 4G plans. Don't get confused, just because the plan words a limit on 4G coverage does not mean your phone will not receive unlimited 3G service once the 4G data limit has been passed. In fact, for the first month of service I opted for an unlimited text and data plan that had structured 4G data, and 100 minutes of talk time for just $30/month. Thanks to the freedom of prepaid plans I can easily test out this low minute plan one month and adjust my time up as needed the following month. My #HTC8 has a complete My T-Mobile tile that displays my current monthly data, message, and minute usage so far. There's no fancy phone number sequences to remember or account information to save online, it's all visible through my handset! While some are anticipating T-Mobile's iPhone release in the coming months, I've already discovered the hottest handset on the market, the Windows #HTC8, and it's even ready for pre-paid! What Daughter Says: Don't tie yourself down to a long term contract, enjoy the freedom of the HTC 8x with T-Mobile no-annual-contract phones. We are all about prepaid cell service. Just can't spend the money on monthly plans like we used to have to.